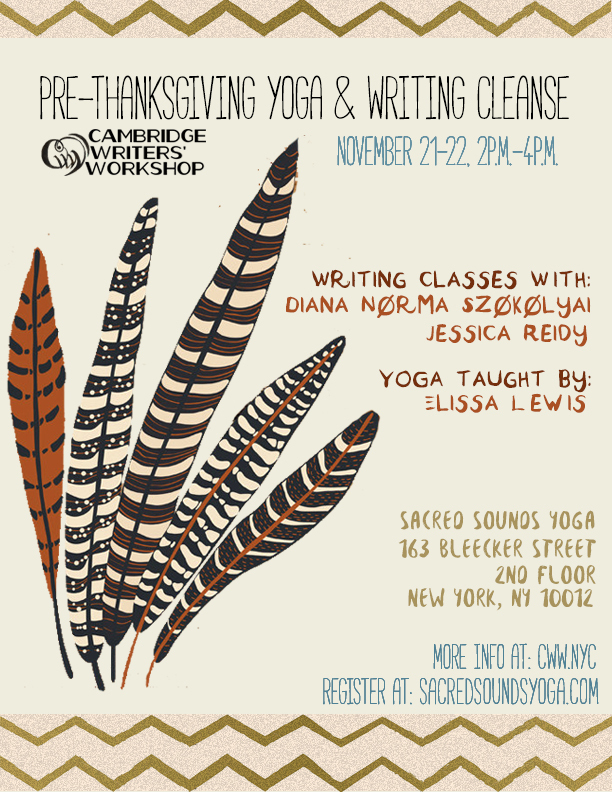 Join our 3rd annual Pre-Thanksgiving Yoga & Creative Writing Cleanse. As the leaves are changing colors, bring some of those transformations into your life. Before re-uniting with family for lots of heavy food and holiday affairs (along with the cheer and stress that comes along with it), treat yourself to a weekend of creative writing & yoga. If you’re participating in #NaNoWriMo 2015, come join us, rejuvenate your creative juices, and enjoy working on your novel in a relaxing environment! The writing workshop is for all levels of writers and open to all genres. Elissa Lewis will begin class each day with a gentle vinyasa flow to relieve stress in the body followed by restorative poses, essential oils and yoga nidra. She will focus on the ajna chakra, or our “third eye,” the lens which we see the world through. This asana is ideal for “opening up the third eye” so that we’re intuitive, imaginative, and able to visualize. Then, writing instructors Diana Norma Szokolyai Jessica Reidy will lead you in generating new material for existing or potential writing projects. Diana Norma Szokolyai is a writer/interdisciplinary artist/educator and Executive Artistic Director of Cambridge Writers’ Workshop. She frequently records her poetry with musicians and has collaborated with several composers, such as Jason Haye (UK), Sebastian Wesman (Argentina), Peter James (UK), Julie Case (US), Jeremie Jones (Canada), Claudio Gabriele (Italy) and David Krebs (US). Her poetry-music collaboration with Flux Without Pause led to their collaboration “Space Mothlight” hitting the Creative Commons Hot 100 list twice in 2015, and can be found in the curated WFMU Free Music Archive. Her writing on literary communities was the subject of a monthly feature on HER KIND by VIDA: Women in the Literary Arts and an interview on the same topic was featured in Quail Bell Magazine in May 2014. Author of the poetry collections Parallel Sparrows (honorable mention for Best Poetry Book in the 2014 Paris Book Festival) and Roses in the Snow (first runner-­‐‑up Best Poetry Book at the 2009 DIY Book Festival), she has also been published in Quail Bell, International Who’s Who in Poetry 2012, Lyre Lyre, The Boston Globe, Dr. Hurley’s Snake Oil Cure, Polarity, The Fiction Project, Up the Staircase Quarterly, The Dudley Review, and elsewhere. Her writing has been anthologized in Always Wondering, The Highwaymen NYC #2, Other Countries: Contemporary Poets Rewiring History, The Cambridge Community Poem, and Teachers as Writers. She co-­curates a poetry-music series, performs in CHAGALL PAC, and is an interdisciplinary performance artist with the Brooklyn Soundpainting Ensemble. She lives in Brooklyn, NY and holds an Ed.M degree in Arts in Education from Harvard, as well as an M.A. in French literature from UConn. 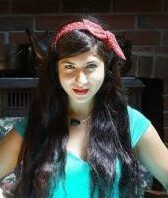 Elissa Lewis is the Yoga & Arts Coordinator of the Cambridge Writers’ Workshop. She began her journey with yoga in 2006, when she moved to France and made the practice part of her daily routine. She saw yoga as a lifestyle, not only a class, helping her to clear her mind and have more compassion for herself and others. In 2010 she moved to New York and completed her teacher training at Laughing Lotus, a creative, soulful yoga studio that teaches the student to ‘move like yourself.’ She’s taught private and group classes in Manhattan and Brooklyn ever since. Visit her websitefor informative yoga sequences and information. You can also email us at directors@cambridgewritersworkshop.org if you have any specific questions. Follow us on Facebook, Twitter, and Tumblr for more information and to learn more about upcoming events.